That’s a bit of a weird way to start off a post about a cauliflower recipe, no? It’s true though – while its heathy, I just don’t love cauliflower. I don’t love the way it smells, or how it can taste bitter. 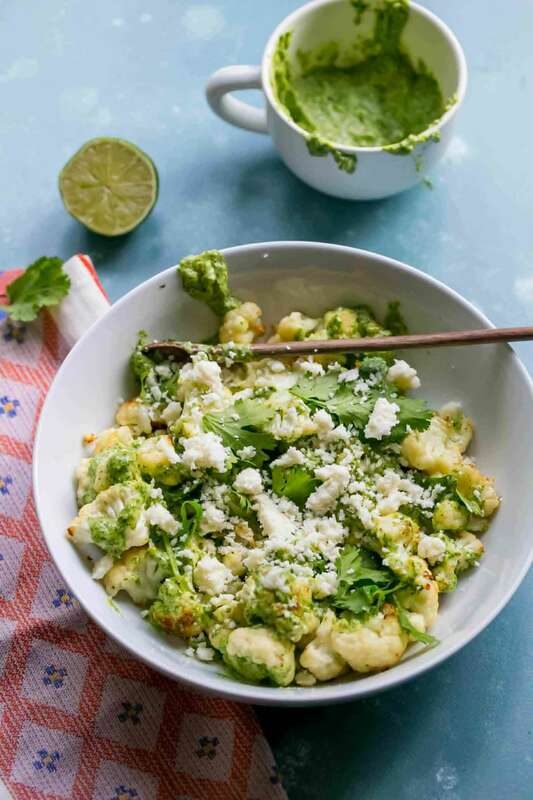 But this Roasted Cauliflower with Cilantro Cashew Pesto recipe changes ALL of that. Not only is this recipe for Cilantro Cashew pesto that my mom put her own twist on amazing (I can literally just eat it straight from the bowl) – but it makes cauliflower taste more buttery, rich, and creamy than you’d ever imagine. It is so delicious- you won’t be able to get enough! This dish is so rich and comforting, and full of fresh flavors. I know you will love it as much as I do! 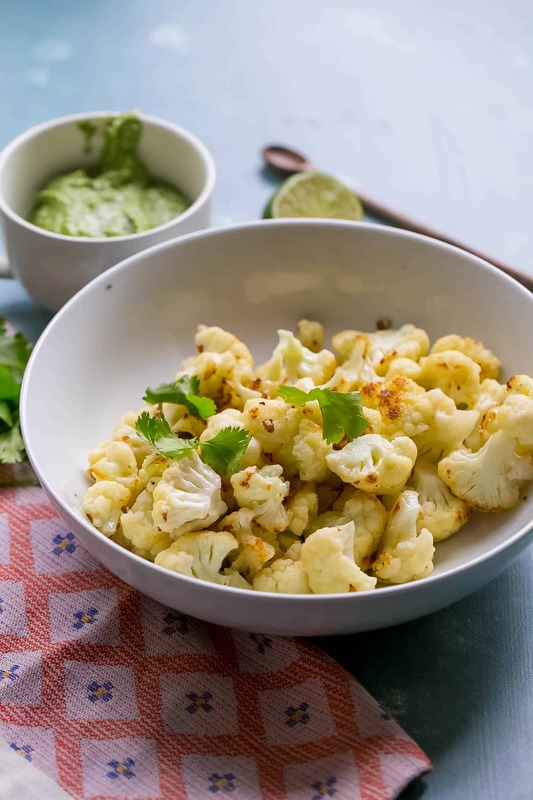 just take me to the Roasted Cauliflower with Cilantro Cashew Pesto recipe already! 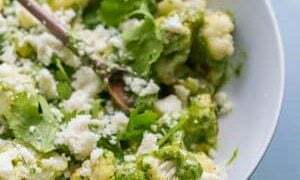 If you’d rather skip my (very helpful, i think) tips and tricks, essential cooking info, and similar recipe ideas – and get straight to this easy Roasted Cauliflower with Cilantro Cashew Pesto recipe, simply scroll to the bottom of the page where you can find the printable recipe card. I’m partial, but to me, the best way to cook cauliflower is super simply in the oven, dry-roasted with just a bit of olive oil or butter and salt. Roasting the cauliflower brings out a buttery flavor that is rich and not the least bit bitter, like cauliflower can often taste. Roasting cauliflower is simply my favorite – and it is so easy! 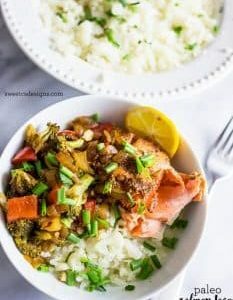 Much of cauliflower’s rich flavor comes from the browning that happens when roasting cauliflower in the oven – so having more surface area on each bite of this dish is vital to melt-in-your-mouth delicious cauliflower. Cauliflower will take longer to cook, and wont brown well if there is little surface area touching the baking sheet. Trim stem from cauliflower head, and then trim cauliflower florets to maximize area that will brown on the baking sheet when roasted. This means trimming florets to bite-sized florets – anything small enough to eat without cutting again. Cauliflower can stick to baking sheets while roasting depending on how much water it gives off (which varies wildly depending on the vegetable, what time of year it is, what the humidity in your home is, etc.) – so I find its easiest to cook and clean roasted cauliflower on a baking sheet lined with parchment paper. Spread Cauliflower out on baking sheet. Give your cauliflower florets plenty of room to roast evenly – if you crowd the pan, it will take longer to brown and cook! I dont like to add much to cauliflower when cooking it so the simple, buttery flavor shines through – but do love a touch of olive oil or butter and a sprinkle of salt. Roasting cauliflower for the best flavor is all about developing a maillard reaction (the browning on the vegetable – this is what produces the delicious buttery flavor when baking cauliflower in the oven) – and flipping it over or stirring it while roasting to make sure it cooks evenly will get you the best flavor. Stir once or twice while cooking, once cauliflower has browned slightly, so it cooks evenly on both sides. Don’t stir too often, or it will keep your cauliflower from browning. 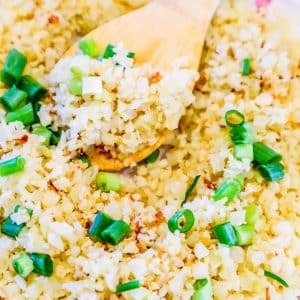 This side dish is also great a few days later – it tastes even more delicious as leftovers a day or two after you make it – which makes it a perfect lunch side when you’re on the go! 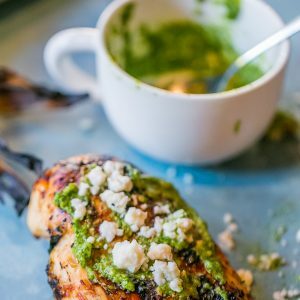 cilantro pesto is salty, cheesy, rich, and delicious – with a tangy zip from the cilantro. It is SO delicious, I could drink it out of a bowl…. 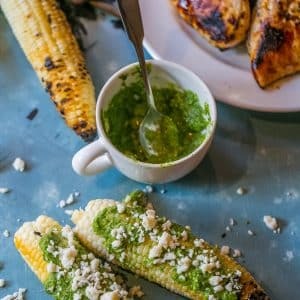 so naturally, I’ve made a couple of different recipes with cilantro pesto! 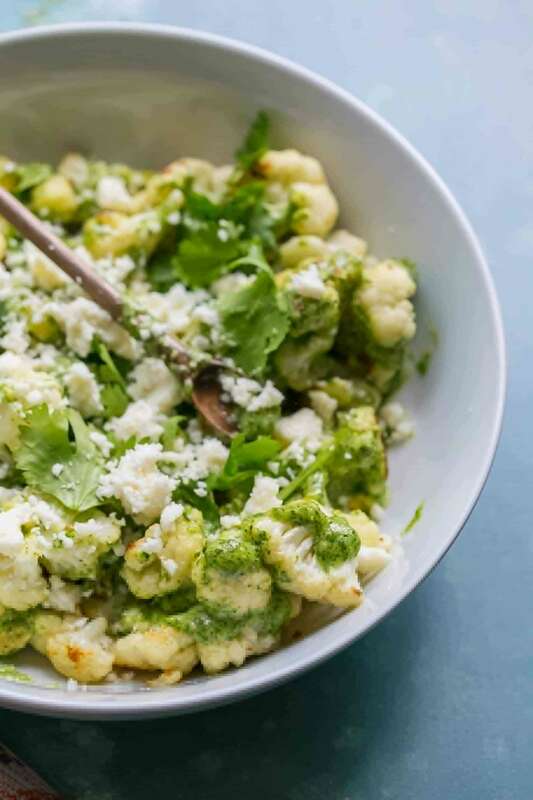 If you love this Roasted Cauliflower with Cilantro Cashew Pesto recipe as much as I do, please write a five star review, and be sure to help me share on facebook and pinterest! Add cauliflower to baking sheet and roast at 350, turning occasionally, until soft and slightly browned- about 25 minutes. Add all other ingredients except 1/2 cup cotija for topping into a food processor. Pulse until smooth and creamy. 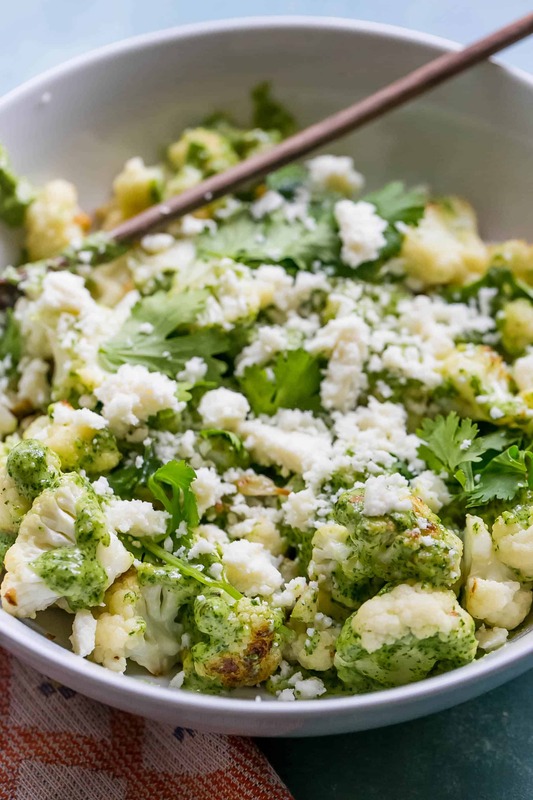 When cauliflower is roasted, place in bowl and top with pesto sauce, and remaining 1/4 cup cotija cheese. This sounds delicious. I like how simple it is to make too. 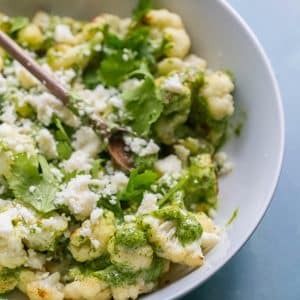 I love Cauliflower and pesto, so this sounds like a yummy combo. Thanks for joining the Family Joy Link Party! 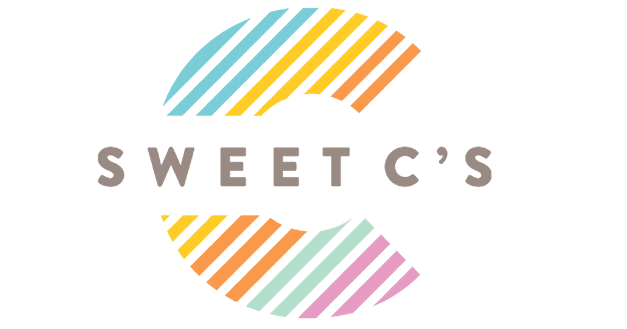 Courtney- I love the flavor combinations! Pinning!! Oh my sounds so good!Thanks for sharing at the What’s for Dinner link up!